Panda Express, now celebrating its 30th anniversary, is airing a new TV ad promoting a new entrée, Honey Sesame Chicken Breast. This time, the panda characters -- "Eddie" and "Tom-Tom" -- ponder becoming beekeepers in order to make their own version of Honey Sesame Chicken Breast, with unfortunate results. The ad then segues to close-ups of the new menu item. The "King Bee" ad is now airing in spot television markets across the country. System-wide sales for Panda Express, which has 1,600-plus locations in 46 states and continues to expand, have risen by 55% since 2008. Marketing and advertising efforts spanning TV, outdoor, digital, radio, social media and in-store signage, combined with new menu items and packaging innovations, have helped drive the chain's growth, according to Siltanen & Partners. For example, Panda Express's Facebook focus in recent times has grown its "likes" to more than 3.2 million. Interestingly, the chain's Twitter account shows nearly 8,500 followers, although Panda Express has yet to post a single tweet (and the site also shows no tweets from followers or others). 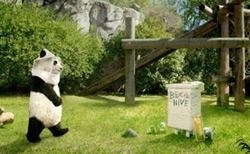 A message on the Twitter account reads: "We wish we could tweet but we're busy wokking up Panda favorites. Orange Chicken, anyone?"